Below are excerpts from its website and some of its videos. You can discover more via the following link. Information about innovative initiatives and modern-day heroes have a colossal impact. More than merely shedding light on solutions, these news stories can spark more action, giving people the desire to create change. Unfortunately, really good solution-based initiatives are hard-to-find that need to be valued and shared. At the same time, the journalists behind those news deserve to be honored for the quality of their work and their impact on the world. FIRST impact: the media informs us against injustices and its derivatives – they alert us. SECOND impact: the media enlightens us about existing solutions to these problems – they give us the means to act. Sourcing through a collaborative video platform about innovative solutions: open-source, wide-spread, positive. Sharing the broadcasting inspiring stories: our main project is the Impact Journalism Day (22 newspapers in 20 countries in 2013). Promoting good practices through consulting services and interventions in public events or private seminars: CSR, innovation, sourcing services, etc. We are a community of journalists, social entrepreneurs and individuals driven by common values and a shared desire to shed light on great innovative initiatives in order to spark action. At 24, Christian completed the first-ever world tour around the search of grassroot initiatives. A bestseller came out of it (L’Espérance autour du Monde, Pocket) with a wave of civic engagement from his readers. He then initiated and cofounded Reporters d’Espoirs – Reporters of Hope – piloting the project for 4 years. Christian was also an educator of disadvantaged youth as part of his civil service and a project leader for Engineers without Borders. 20 countries. 20 newspapers. 50 million readers. 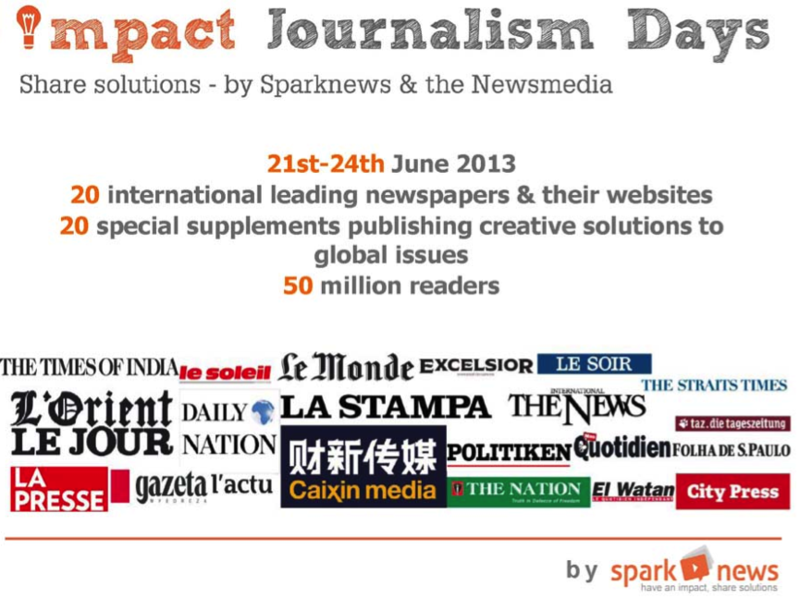 Sparknews invited the world’s leading newspapers to come together and share stories of hope, change and innovation. That’s impact. It’s happened to nearly all of us at some point. Whether leafing through our daily newspaper, or reading it online, one story seems to jump out and make us think. Readers today are hungry for those stories. Stories of bright ideas that spark change, both locally and globally. Change we can identify with and participate in. This is Impact Journalism. Focusing on solutions is energizing. Very quickly the good mood goes viral, the ideas get shared and developed, and the sparks start flying. The impact can be unexpected, humbling and exhilarating. And it changes the way we think about news and newspapers. Impact Journalism Day works through sharing. Each newspaper in the project found the most inspiring change-makers and creative innovations in their country, and offered those stories to all the other partners. Sparknews also contributed over 20 original articles to the IJD package. Each editor created their own dedicated solutions supplements from this collaborative content. We all know that “bad” news must be reported. But why not report on the answers too? Ordinary people all over the world are finding extraordinary solutions to some of the biggest problems we face. By making sure these ideas reach the widest possible audience means they have the greatest space to grow.